There are two problems we find with this term which has led many to be confused on when the Pesach is to be done. The first problem is that the verses which deal with the time seem to not be clear what day the Pesach is to be done. Is it the 14th, the 15th, or even the end of the 13th? The second problem is that during the second temple, a new interpretation was created. It seems that due to the large amounts of people showing for the feast, it was impossible to do the Pesach at the short time prescribed (I will get to it in a moment). Because of this new interpretation, we have a new layer of data which has caused many people to be even more confused about this term. 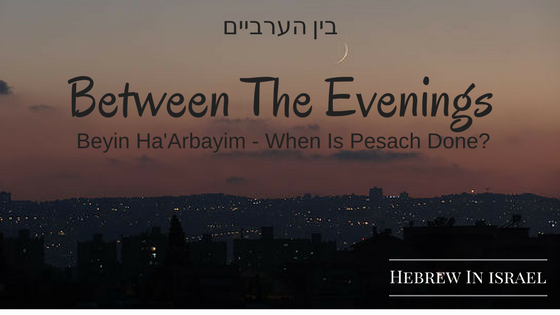 The word בין is a preposition that means between, hence this term means “Between the evenings”. The word ערב-Erev means in Modern Hebrew “evening”, but in Biblical Hebrew it means Sunset. In Akkadian the word Arbu means to enter–meaning the sun enters its resting place. The suffix -yim is a dual form used in Semitic languages to indicate two of something. It is also used for the plural of some words that usually come in twos, but it can be used for the regular plural. The new interpretation used in the second temple attempted to interpret the word Erev as having the meaning of “Evening” which means that it is not the sun setting, but rather the sun moving to the west. This meant that the time was of several hours and lasts from midday to the evening. This interpretation enabled the large number of celebrates to do a very long service which was not limited to just slaughtering the animals. The Mishnah and Talmud in Pesachim 5 describes singing the Hallel (Psalms 113-118) and a complex sacrifice which needs to be manipulated in different stages. This practice created a need to expand the time frame of the sacrifice to midday. What are the two evenings? The answer is the two settings of light. The first setting is of the actual sun, and the second of the light. This means that the time of Bein Ha’Arbayim is modernly known as “Dusk” or “Twilight”. This is the common meaning in Semitic languages, and is the most accurate meaning based on the etymology. Hence all the parts of the animal are used while roasting, making the usual parts put on the altar or given to the Kohen still intact. A Kohen had to bring his own Pesach and was not ascribed to the Pesach of others. None of the parts which make a sacrifice of any kind is given to a Kohen or places on the altar. It seems logical that the forbidden organs (i.e. Chelev) were removed, but other than that the whole animal was taken by the family and eaten only by them. Chronicles 35:13 is an interesting case where we hear of a presumed long ceremony which includes more sacrifices than ascribed in the Torah. It is not unusual for Chronicles to express a common practice of its time and try to harmonize Biblical texts, and throw back on times of the past. Chronicles attempts to harmonize the description of animals in Exodus 12, which only talks about sheep and goats, and Deuteronomy 15:2 which adds cattle. By doing this, the author of Chronicles creates a complex service to accommodate a contradiction in the text by introducing “Qodashim” sacrifices (to expand on this see the work of Sara Japhet and commentators). What we actually learn form this is that in early 2nd Temple they had already stumbled on a problem in the commandment, and they shifted to a different practice which was expanded in later rabbinic rulings. The other part to the confusion is what part of the day does the time frame belong to? Exodus 12:18 clearly connects the feast of unleavened bread to the doing of the Pesach, but the text also says the it is the 14th in the evening. If we remember that the books of Exodus and Deuteronomy have a “day starts at sunset” concept, the confusion becomes evident: if it is the 14th in the evening, then is it the end of the 13th day after sunset or the end of the 14th? Some have tried to explain that the day begins at sunrise based on Leviticus and Genesis (De Vaux, Milgrom and more), and claim that the day has not ended and it is still the 14th. These arguments ignore the difference between Leviticus, which is temple centered where services are only during the day, and the rest of the bible which is not (the Genesis argument is to long to explain here, and we might deal with it at another time). On top of this, the Pesach is unusual because it is an individuals responsibility and is done by the owner regardless of the Kohanim, and therefore is actually different than usual temple practice. It also is done at a time when usual temple services end–with the last evening offering of the Tamid (Numbers 28:1-10). The reason the text uses such difficult language is because of the ambiguity of this time of day. On the one hand it is still light time, but on the other the sun is not out and has set behind the horizon. It is also the split-second change between one part of time and the other, leaving it in a problematic state in time recognition. This problem was recognized by other cultures, and this time of day was seen as a middle ground and a border between day and night, and the different days. To avoid any confusion the text created a link in chapter 12 to the feast of unleavened bread which is on the 15th, making it clear that this time is connected to the next day, and is to be done at the end of the 14th leading to the 15th day. One can notice a slight roughness in the transition between verses 14 and 15 where the text shifts from the Pesach to the feast. The subject of the whole chapter is the Pesach, and this section from v. 15 to 20 is “out of place”. This is not an unusual thing in the Torah, and sections which relate to one thing will be inserted into the storyline by association or relevance (S. Talmon “The Ways of the Biblical narrative, Hebrew University 1965). When reading the text in full, one can see the transition point in verse 15 when the subject changes from the laws of Pesach to the laws of Chag Hamatzot. יז שָׁלֹשׁ פְּעָמִים, בַּשָּׁנָה–יֵרָאֶה, כָּל-זְכוּרְךָ, אֶל-פְּנֵי, הָאָדֹן יְהוָה. יח לֹא-תִזְבַּח עַל-חָמֵץ, דַּם-זִבְחִי; וְלֹא-יָלִין חֵלֶב-חַגִּי, עַד-בֹּקֶר. יט רֵאשִׁית, בִּכּוּרֵי אַדְמָתְךָ, תָּבִיא, בֵּית יְהוָה אֱלֹהֶיךָ; לֹא-תְבַשֵּׁל גְּדִי, בַּחֲלֵב אִמּוֹ. 17 Three times a year all your men are to appear before the Lord, YHWH. 18 You are not to offer the blood of my sacrifice with leavened bread, nor is the fat of my festival to remain all night until morning. 19 You are to bring the best firstfruits of your land into the house of YHWH your God. In conclusion, the term is used for indicating a time that belongs to the end of the light time of the day when the sun sets, but there is still light. This time of day is in limbo and creates a difficult time reference which has created confusion. The understanding of this term is that it is used to describe the time between two days, and exists both in the previous day and the next. It is a transitional time which takes the person out of the previous day and takes him into the next. Photo: New Moon in 2014, taken by Yoel Halevi.